How to apply for NAO2019? Submit the duly filled application form, photocopies of SEE mark-sheet (For Senior Category) or BLE mark-sheet (For Junior Category), character certificate and deposit slip at one of our application centers or representative near you. Who can apply for NAO2019? Students who are currently studying at class 11-12 or equivalent and between of age 15-20 years are eligible for the Senior Category. How to prepare for NAO2019? Students first need to identify eligibility for either junior or senior category. Students must be a part of National Astronomy Olympiad (NAO) to be eligible for the further round or any other opportunities in 2019. Students who show good performance at the entrance (to be held on January 26, 2019) will be selected for the second round. Students selected for the second round (pre-closed camp) will go through several hands-on tasks and only good performing students will be selected for the third round (closed camp). Students will have classes on theoretical astrophysics, observational astronomy, and data analysis. A merit list is created based on the performance of the students in the final exam as well as overall performance during the closed camp. The highest scorer will be announced as the absolute winner of the NAO2019 and top five students will receive certificates and medals. All the participants from the closed camp will be provided certificates as per their merit. Students will get exposure as per their merits. Featured in media and provide an opportunity for their strong community engagement through our outreach programs. Students will get an opportunity to attend international olympiads as per their merits. Students will be facilitated for the scholarship opportunities for their higher studies in Nepal and abroad based on their merits. If you have any queries regarding your eligibility or for the nearest entrance exam location, please do not hesitate to call us at 9843708248. Our team will be happy to guide you to complete your application and be a part of this national competition. The results of the first round of the 6th National Astronomy Olympiad 2019 (NAO2019) for junior and senior categories are published today! Click here for the result of junior category. Click here for the result of senior category. We are currently evaluating the answer-sheet of the students and the result of the 6th National Astronomy Olympiad 2019 (NAO2019) will be available by February 20, 2019. Total of 111 students participated in the 6th National Astronomy Olympiad held at all seven provinces of Nepal. NAO2019 will be held in all seven provinces from 12:00 PM- 2:00 PM, Saturday, January 26, 2019. Click here for more details. Following several requests from students and schools, the NAO2019 application deadline has been extended until Wednesday, January 23, 2019! The first round of selection will be held during 12:00 PM- 2:00 PM on Saturday, January 26, 2019! Don’t miss the opportunity! An updated syllabus is now available for the 6th National Astronomy Olympiad 2019. Click here to download the syllabus for Junior Category. Click here to download the syllabus for Senior Category. There will be separate question papers for each category! Updated Syllabus will be available soon. Stay tuned! Application opens for the 6th National Astronomy Olympiad 2019! The first selection round will be held on Saturday, 12:00-14:o0 Hrs, January 26, 2019! Click here to download the application form! Submission deadline is Friday, January 18, 2019! Er. Reman Bala bags the 6th National Astronomy Olympiad 2019 Logo Competition! For more info, click here. Total of 13 logos has been selected for further evaluation! Shortlisted logos have been contacted for further information. Thank you all for your valuable inputs for our logo competition! We received a total of 83 logos! Our team will evaluate the submitted logos and contact shortlisted logos for further information. 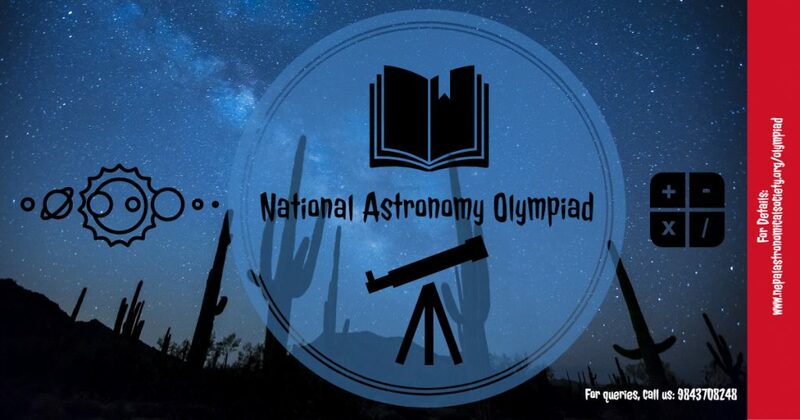 Application open for the 6th National Astronomy Olympiad 2019: Logo Competition! Application deadline is November 30, 2018! Click here to submit your logo. For more info, click here to read our latest blog. Mr. Shronim Tiwari, Mr. Bedant Lohani, Mr. Shubham Sharma, Mr. Rubek Poudel & Mr. Pratik Bhandari will represent Nepal at the 12th International Olympiad on Astronomy and Astrophysics, Beijing, China, November 3-11, 2018. Mr. Hem Shrestha and Ms. Sumi Gurung from province 1 participated at the Astronomy Olympiad Exposure Camp, Mumbai, India, October 22-25, 2018. Mr. Bishal Baral received a special award for the best result among the new participating countries at the 23rd International Astronomy Olympiad, Colombo, Sri Lanka, October 6-14, 2018. Mr. Bishal Baral (NAO2018 Rank: 6th) and Mr. Hardik Shrestha (NAO2018 Rank: 8th) will be participating in the 23rd International Astronomy Olympiad, Colombo, Sri Lanka, October 6-14, 2018. Nepal will participate in the 23rd International Astronomy Olympiad, Colombo, Sri Lanka, October 6-14, 2018. Nepal will participate in the 13th International Olympiad on Astronomy and Astrophysics (IOAA2018), Beijing, China, November 3-11, 2018. The 5th National Astronomy Olympiad Closed Camp result is out now. Click here for the result. The closed Camp will be held at Southwestern State College (SWSC)-Basundhara, Kathmandu during August 3-10, 2018. Mr. Bijaya Chandra Luitel & Mr. Tarun Timalsina, NAO and IOAA alumni, will join the academic team of the 5th National Astronomy Olympiad. The pre-closed camp result is out now! Click here for the result. The pre-closed camp assignment submission deadline has been extended till June 30, 2018. The pre-closed camp (Second round) is ready to welcome selected students from the first round during May 25-June 15, 2018. The pre-selection (First round) examination result has been published this morning. Click here for press release and the merit list. The pre-selection (First round) examination result will be available on March 31,2 018! The pre-selection (First round) examination will be held on Saturday, February 17, 2018, during 12:00 PM- 2:00 PM at Biratnagar, Chitwan, Kathmandu, Pokhara, and Dhangadi only. Please note that reporting time at the exam center is 11:00 AM. The application deadline has been extended till February 15, 2018! The late application fee is NRs. 1,100/- only. Feel free to visit one of our application centers located at Biratnagar, Chitwan, Kathmandu, Pokhara, Butwal, and Dhangadi (please refer to the Handbook for more details) to submit your application. Application deadline closes on February 9, 2018! Feel free to visit one of our application centers located at Biratnagar, Chitwan, Kathmandu, Pokhara, Butwal, and Dhangadi (please refer to the Handbook for more details) to submit your application. NAO2018 Application Form and Handbook is now available! The NAO2018 application is now open! The last date to submit the application is Friday, February 9, 2018! The NAO2018 logo has been selected! Five teachers participated in Astronomy Olympiad Exposure Camp in India! Would you like to be our member? 3rd NASO Women in Science Award 2019 calls for Applications! IAU appointed a new National Outreach Coordinator (NOC) for Nepal for next three years! Application for the 6th National Astronomy Olympiad 2019 is Open!